What makes Golden Peak Legendary? If you’re looking for a bite to eat, be sure to to stop by Larkburger, or the recently renovated Golden Peak Grill to enjoy a multitude of food options. Golden Peak is the Eastern most base area on Vail Mountain. Take the InTown bus to the Golden Peak stop. Learning how to ski and ride! Easy access to the rest of Vail’s legendary terrain. ● Gopher Hill: The perfect place to take a lesson with Vail Ski & Snowboard School. Ease into the day by riding the magic carpet until you are ready to ride Chair #12, your first ski lift! ■ Ruder’s Run: Ruder’s is a wide, gently graded blue trail that parallels a gorgeous grove of aspen trees. 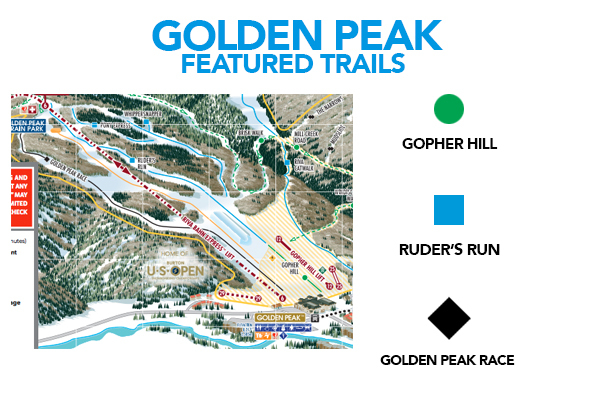 ◆ Golden Peak Race: the Golden Peak Race Course is a training ground for ski racers, from the local Vail Ski & Snowboard Academy, to full blown professionals honing their skills for competition season. Keep an eye out for Vail local & Olympic champion Lindsey Vonn, who has been known to stop by and take a few laps.